First off, please excuse the mildly deathly looking cacti, they are in need of some loving. 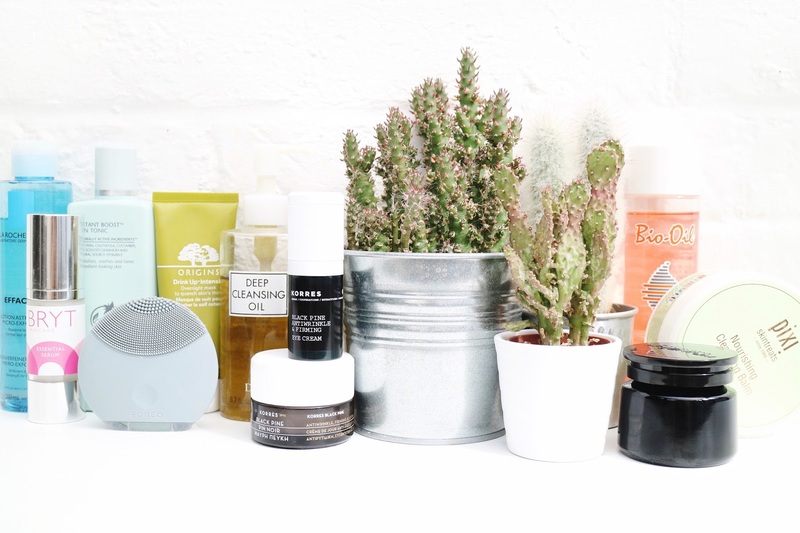 It seems like FOREVER since I last put together a post on my current favourite skincare products, so here we are once again. I still have some staple products that I absolutely adore and have no reason to ever switch from, and also have a few new finds too. To remove make up and cleanse my skin, I go for DHC Deep Cleansing Oil (£21.50) for everyday use and Pixi Nourishing Cleansing Balm (£18) when my skin is in need of a deeper cleanse and nourish. The DHC version is absolutely unbeatable as a make up removal oil and is the perfect option for my typically dry skin, and the Pixi balm is ideal to let soak into the skin for a couple of minutes whilst in a bubble bath. I discovered La Roche Posay Effaclar Micro-Exfoliant (£8 - on offer!) a few years back when in France and have used it on and off ever since as a way of removing dead skin cells and prepping for my night cream. I much prefer to use a liquid exfoliator as they are proven to be much kinder to the skin over cream versions that have tiny beads in. It does a great job at throughly cleansing my skin without leaving it feeling stripped and dry. I tend to use this two times a week and then in between I will opt for Liz Earle Instant Boost Tonic (£14.50) which has been a firm favourite of mine ever since I first start blogging, six(!) years ago. In the last few weeks I've made a real effort to take better care of my skin and to moisturise both in the morning and evening, along with introducing a serum into my routine. Every night I apply the Bryt Essential Serum (£16.50) and after allowing it to sink into my skin for ten minutes or so, I follow up with Korres Black Pine Eye Cream (£36) and Day Cream (£39). Although it may seem as if I'm slightly breaking the rules using a day cream for night, I find that more often than not they are suitable for both and there's no need to invest in one of each. That being said, whenever my skin is in desperate need of nourishment I treat myself to a small amount of Argentum La Potion Infinite (£147) which without fail leaves my skin looking fresh and radiant the next day. Another weapon of choice, at a slightly more accessible price point, is Origins Drink Up Intensive Mask (£23) which does absolute wonders for any dry areas and is something that I'd recommend everyone stocks up on. It's one of the only products that I've ever found to work instantly on dry skin and have a lasting effect. Bio-Oil (£19) is of course an oldie but a goldie and is something that I've once again rediscovered. I'm absolutely useless when it comes to any kind of routine, but whenever I remind myself to, I apply the oil from head to toe just before bed. I've without a doubt noticed a difference in the appearance and feel of my skin since starting using it again and find that any kind of lotion or cream just doesn't do the job nearly as well. It also makes a wonderful face oil and is comparable to higher end brands if you want to save yourself some pennies. I also want to give a quick mention to the Foreo Luna Mini (£85) which has soon become my new favourite cleansing device. I'm lucky enough to also own a Clarisonic, which as much as I love I have to say that the Foreo comes out on top down to it being much more hygienic, portable and less expensive. If there's anything in particular that you'd like for me to write up a full review on, please do let me know. I already have a plan to properly talk about the Korres products as I want to waffle on a bit more about how great they are, and it goes without saying that I am a huge fan of the packaging too. Great products. I love La roche posay products and the exfoliator you mentioned here sounds lovely. I have quite sensitive skin so I tend to go for the gentler liquid exfoliators. Currently been using the body shop seaweed one but I want to try out another one from a different brand.